20 September 2012 (St. Johns, Antigua) – An Intertops Casino winner had a remarkable run of good luck when he recently won over $160,000 in a two-day period. Adam B. from Texas struck it rich on the Chinese-themed slots game Year of Fortune. Year of Fortune is a 5 reel, 25 pay line slot with a Chinese theme. It has a progressive jackpot, triggered by five God of Wealth symbols, which is currently just over $25,000. 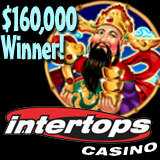 Intertops was one of the very first online casino, poker and sportsbook sites on the internet. Known for friendly customer service and hassle-free deposits and withdrawals, Intertops has been trusted by players around the world for more than 15 years.